Extra Strength Formula Assists in Rebuilding Joints & Decreasing the Pain & Discomfort associated with Joint Problems. Long Term Use Will Help Preserve & Improve Deteriorating Joints so Your Dog Can Live A Long, Happy & Active Life. 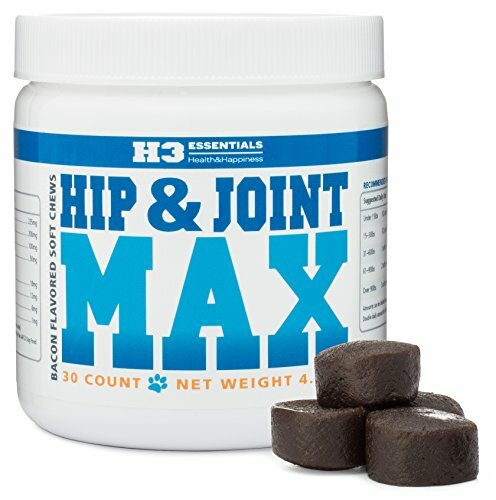 This Powerful Hip and Joint Supplement for Dogs is Great For Older Dogs, Larger Middle Aged Dogs, Small Dogs with Advanced Joint Disease and Agility Dogs. CERTIFIED SAFE by Independent Lab. Microbiological tested for EColi, Salmonella, Staphlococcus Aureus, Coloforms, Yeast, Mold & More. Made Right Here in the USA in our FDA, USDA and FSIS Regulated Manufacturing Facilities in Small Batches for Quality and Freshness. This quality arthritis pain relief supplement is an effective solution for dogs with hip joint pain & discomfort associated with arthritis. See images above. It contains 225 mg Glucosamine and 100 mg Chondroitin Sulfate which helps rebuild damaged bones. It also contains 200 mg of MSM (methylsulfonylmethane) which may also boost your dog’s immune system, help with GI upset and allergy symptoms. This joint health supplement is specifically formulated for use in older dogs, middle-aged dogs or small dogs with advanced joint disease. It comes in a delicious bacon-flavored chewable treat your dog will be sure to love. Made in USA in FDA, USDA & FSIS regulated manufacturing facilities to ensure the highest standards of quality. 30 Count Jar. Order yours today!